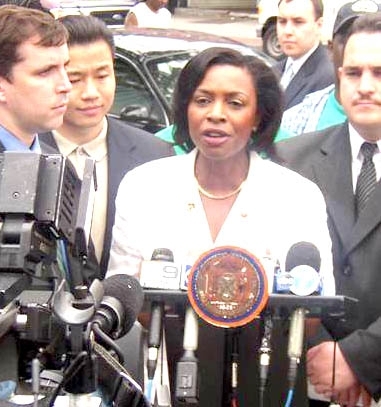 Yvette Diane Clarke won her first political office when she was elected a member of the New York City Council representing part of Brooklyn in 2001. Clarke succeeded her mother, former City Councilmember, Dr. Una S.T. Clarke, making them the first mother-daughter succession in the history of the New York City Council. Clarke was born in Brooklyn, New York on November 21, 1964. She attended New York’s public schools and then entered Oberlin College in Ohio, graduating in 1986. Clarke served as the first Director of Business Development for the Bronx Empowerment Zone where she administered the $51 million budget that resulted in the revitalization and economic development of the South Bronx. Clarke also chaired the powerful Contracts Committee and co-chaired the New York City Council Women’s Caucus. In 2006 Clarke was elected to the United States Congress to represent New York’s 11th Congressional District. She holds the seat first won by Shirley Chisholm in 1970. Chisholm was the first African American woman and the first Caribbean American elected to Congress. Clarke is currently a member of three House committees and two subcommittees within each committee. Her House committee assignments are as follows: Education and Labor Committee, Homeland Security Committee, and the Small Business Committee.